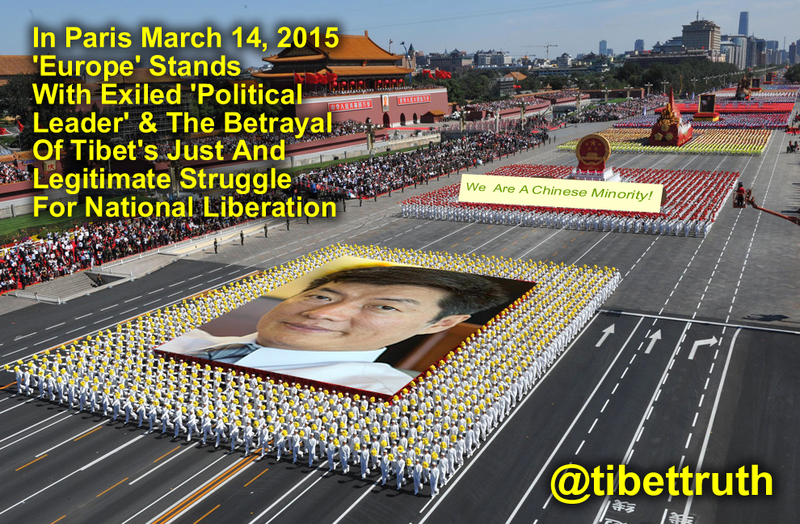 China Should Get The **** Out Of Tibet And Lobsang Sangay Needs To Support The Tibetan People! Once there was unity between the struggle waged by the brave Tibetan people and their exiled government. The shared vision was to regain the rightful national freedom of Tibet. 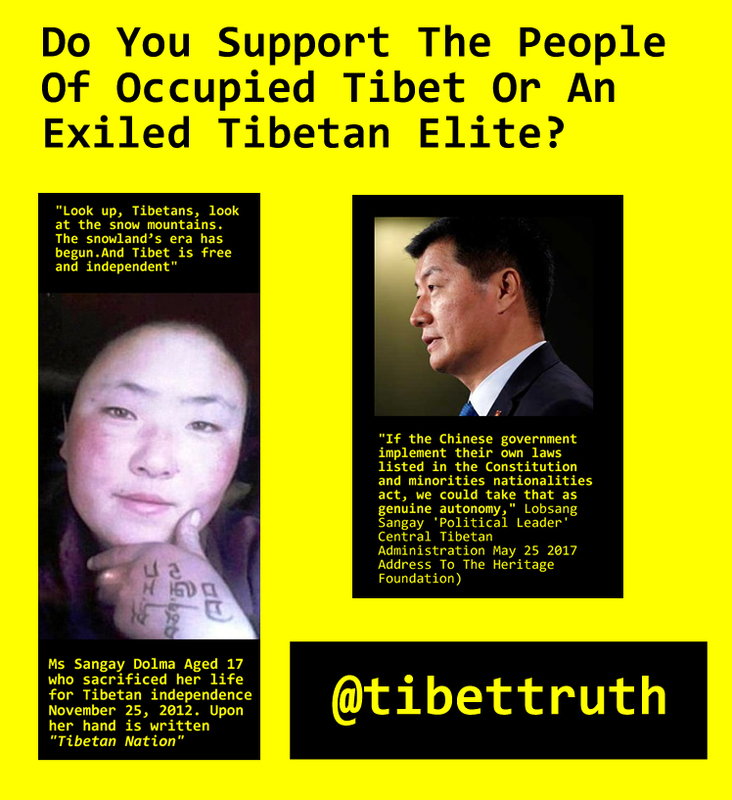 Now, as Tibetans inside occupied Tibet suffer the terrifying oppression of Chinese tyranny and yet still demand independence for Tibet, in exile an elite Tibetan political cabal is on its knees to the Chinese regime seeking a dangerously compromised ‘solution’. This treacherous surrender has been going on for a number of years now, but since the election, as ‘political leader’ of Doctor Lobsang Sangy the pace of capitulation has increased. His latest public overture on the subject was given to the US Heritage Foundation May 25, 2017 during which he repeated the mantra of a negotiated settlement. The aim of which would be autonomy under Chinese rule. Any reading of Tibetan political protest inside Tibet reveals the goal is, and has been consistently, one of national independence for Tibet and the return of the Dalai Lama. Not sure how the courageous Tibetans of Tibet would feel hearing such appeasement from the head of the Central Tibetan Administration, one thing for sure though in exile Tibetans have decided to invest their hope and trust in Lobsang Sangay. Well they can be certain of one thing about his leadership, it will continue to betray the struggle and political aspirations of Tibet’s people. Welcome to democracy! On the bone-chilling streets of Paris yesterday some Tibetans and their supporters could be forgiven thinking that they were witnessing a momentous change of policy by the Central Tibetan Administration as Doctor Lobsang Sangay peppered his keynote speech with references to liberty, justice. and democracy. The Harvard law school graduate began his address by envisioning raising the national flag of Tibet above the Potala Palace in Lhasa, Tibet’s symbol of nationhood and independence was a prominent feature of the event, and formed a huge stage backdrop. Yet this is the man who had boldly declared that he is not asking for democratic rights within an autonomous Tibet! Unfortunately a careful examination of his words reveals not so much a demand from Doctor Sangay and his CTA colleagues for a free and democratic Tibet, but a cynical misappropriation of the rights and political aspirations of Tibetans inside Tibet. When mentioning such freedoms he very carefully avoided officially endorsing the demands made by compatriots under Chinese tyranny. Indeed his speech on referencing ‘liberty’ or ‘democracy’ emphasized repeatedly that such objectives were what ‘Tibetans’ wanted with the obvious corollary that such aims were not being demanded by the Central Tibetan Adminstration. This is evidenced by the policy adopted and promoted by Lobsang Sangay and his colleagues within the CTA which is actively seeking a condition of ‘meaningful autonomy’ for Tibetans. In that objective Doctor Sangay has stated that no separation from China is being sought but only the just and full application of communist Chinese laws on autonomy’ In that context he made it clear during a 2013 interview, given at Washington’s Council on Foreign Relations that as part of his autonomy proposals democracy was not being sought for Tibetans in Tibet! Now given that’s the agreed and formalized policy of the Central Tibetan Administration clearly notions of national freedom and independence are effectively anathema to Lobsang Sangay, marginalized, ignored and rejected as barriers to progressing talks with a Chinese regime ever suspicious of covert agendas. On March 13 China again dismissed any prospect of talks on what is called ‘high autonomy’ for Tibetans. Meanwhile the officially sanctioned ideology that autonomy is the only ‘realistic’ solution continues to forced upon a Tibetan Diaspora. 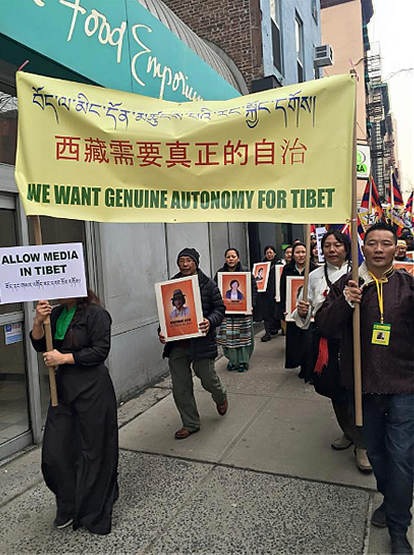 However in trying to prevent Tibetans from expressing their support for a free and independent Tibet the thought-police of the CTA have gone too far and unleashed a wave of outrage and opposition. 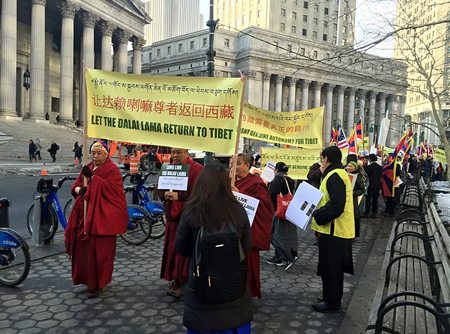 The intensity and scale of unease at the manipulation of protests in New York and Dharamsala has revealed just how embedded within Tibetan communities globally is support for Tibetan national freedom. The very same Tibetans who Lobsang Sangay and his Administration require the goodwill and political support of, which brings us back to possible motive for his flag waving address in Paris. Some Tibetans on various social media sites are already posting glowing comments of support for his speech describing it as ‘powerful’ and ‘strong’ yet they clearly have been fooled by appearance and failed to note the detail of his comments. 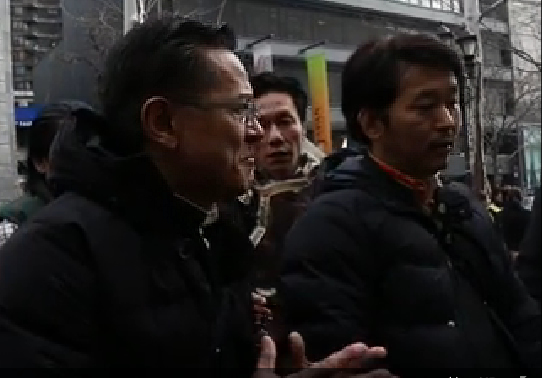 What was declared in Paris was not an approval of, or expression showing solidarity with the cause and rightful demands of Tibetan in Tibet but a carefully engineered and duplicitous display that was more concerned with promoting Lobsang Sangay and presenting an illusion that the Central Tibetan Administration is allied with and shares the objective of national liberation so courageously expressed by Tibetans under China’s genocidal rule. Don’t be fooled people! Paris, France on March 14 is to host an event titled ‘Europe Stands With Tibet’ sounds like a gathering that’s in solidarity with the Tibetan people, right? Wrong! This rally should be more correctly termed ‘A Platform To Promote The Surrender Of Tibet’s Right To Nationhood’ Why so? Well take into account that its been organized and promoted by the Central Tibetan Administration and will feature as main speaker Doctor Lobsang Sangay who will be peddling his message of autonomy under Chinese rule, in the hope of appeasing China. As with recent Tibetan demonstrations in New York and Dharamsala it is likely that the issue of Tibetan independence will not be welcome, at what we understand is to be tightly restricted and orchestrated meeting. Tibetan communities are being bused across Europe to attend and ensure that this propaganda theater has a compliant and obedient audience. No doubt Tibetan flags will be tolerated but that will be a distraction, the central message will be that ‘We are only seeking genuine autonomy’ a condition if ever realized under the brutal oppression of the Chinese regime will not be allowing any degree of Tibetan national identity and certainly will arrest, torture and shoot anyone who dares to raise Tibet’s national banner. Don’t be mislead either should you read of or hear the cynical use of the term ‘freedom’ by the Harvard trained lawyer. While it sounds suggestive of independence it’s used by Lobsang Sangay as it may exist under the various forms of ‘autonomy’, for anyone who doubts such an assessment we refer you to an interview Video Here in which he made clear that his proposals on resolving the issue of Tibet ruled out the prospect of democratic rights for Tibetans in Tibet! This is an individual who while cloaking himself in the Tibetan flag and delivering carefully scripted rhetoric designed to appeal to and manipulate the exiled Tibetan community, is opposed to Tibetan independence and has willfully ignored the demands and political aspirations of Tibetans inside occupied Tibet. If anyone reading this truly wishes to stand with the Tibetan people they will not be doing so by attending this event in Paris, better to show your solidarity with the peaceful resistance being waged by Tibetans in Tibet, join and get active with those organizations who clearly state an objective of national liberation and independence for Tibet. In exile Tibet’s cause reached a disappointing low on March 10, a date commemorating the 1959 Lhasa Uprising and a central focus to honor Tibetans inside Tibet who continue their courageous and peaceful resistance to Chinese tyranny. For the second year running New York was the stage upon which a cynical game of manipulation and the promotion of political approved agendas was acted out.Unlike last year however, when such covert actions were restricted to the prominent placement of slogans promoting the policy adopted by and actively followed by Doctor Lobsang Sangay and the Central Tibetan Administration events yesterday took a disturbing turn for the worse. Chushi Gangdruk had agreed upon excluding from the organized rally any voices or protests that dissented from the officially approved call for ‘genuine autonomy’. freedom of Tibet. As you may imagine the sense of outrage, frustration and sadness which emerged was a cause of much debate and division, resulting in division, accusations and genuine anger. Understandably so, after all the struggle being waged inside Tibet seeks not submitting to Chinese communist laws on autonomy but demands nation liberation and independence, it is the duty and birthright of exiled Tibetans to stand in solidarity with their brothers and sisters in Tibet towards that just objective. disabling division are being duplicitous and delusional in their criticism. Why so? Well the origins for this regrettable incident are to be correctly sourced not to people holding a conviction who support Tibet’s independence, nor can it be explained in any reasonable manner to an unwillingness to tolerate different views on Tibet. The seeds of this divisive and damaging schism were engineered in the political laboratories of a Central Tibetan Administration that for years now has been actively promoting a policy of appeasing China’s regime. It’s Middle Way ‘solution’ seeks not an independent Tibet but merely the application of Chinese communist laws relating to autonomy of so-called ‘ethnic minorities’. Is the CTA an invisible hand behind such actions? There’s a problem though, and one lying in a dark corner that explains events at the rally yesterday, the Chinese regime has long dismissed such overtures from the CTA as a veiled bid for independence. So from the perspective of the Central Tibetan Administration the issue of Tibetan independence is deeply problematical, indeed it is regarded as an obstacle to progressing talks with China, as such a response was needed. 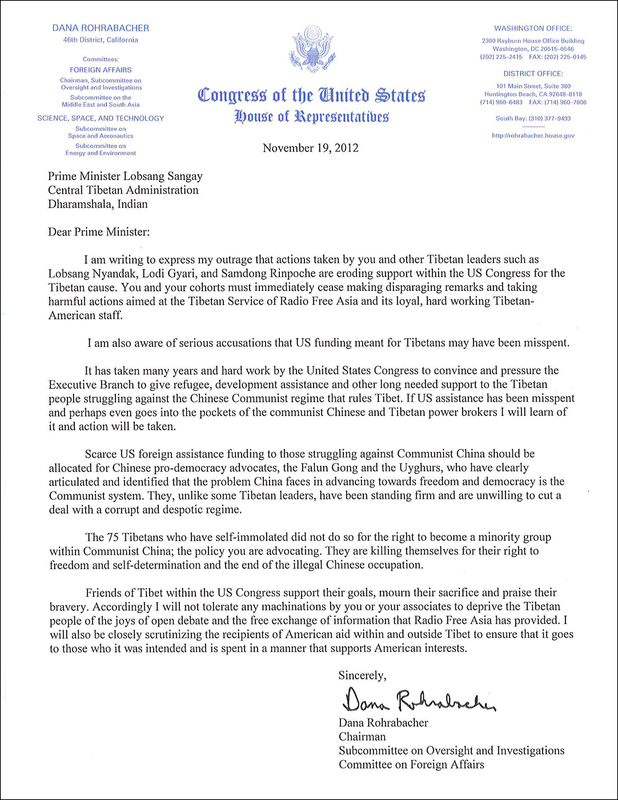 How best to reassure China that the CTA was not advocating an independent Tibet? Statements to that effect were clearly not enough, actions were needed, some physical manifestation perhaps to help dispossess the Chinese government of its suspicions? So in addition to relentlessly affirming via official statements that only genuine autonomy is being sough a covert campaign has been set in motion that’s manipulating various global protests for Tibet, along with the exile Tibetan community into endorsing the official proposals of the CTA. False choices are being presented in which supporting the Middle Way is portrayed as being loyal to the cause of Tibet and His Holiness, while advocates of Tibet’s rightful independence are marginalized as being disloyal, extreme or unrealistic. 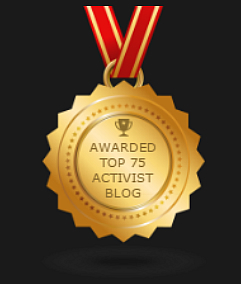 Such has been the toxic and cynical narrative increasingly clouding the exiled Tibetan movement. To the disadvantage and embarrassment of Tibet’s cause there are a significant number of Tibetans in New York who for reasons of conformity, lack of understanding, personal gain or wishing to demonstrate what in reality is a misplaced loyalty now act as censorial attack-dogs for the policy of surrender being pushed by Doctor Lobsang Sangay and his colleagues within the Central Tibetan Administration. Their unthinking obedience is betraying the sacrifices and common political aspirations of their brothers and sisters inside occupied Tibet, such treachery, for that is what it is, needs to be urgently exposed and challenged, in that regard we hope that their disgraceful attempt to silence fellow Tibetans who support Tibet’s independence will serve as a call to action! It’s official! The exiled Tibetan Administration does not equate ‘freedom’ with independence. So dear Tibetan brothers and sisters when in future you hear either Doctor Lobsang Sangay or any other exiled Tibetan official refer to Tibetan freedom be warned that what they mean is not Tibet’s independence but something far less, the subservient condition of autonomy! We have been trying to inform people of the distinction between the meaning and application of the terms independence and freedom for some time Article HERE and so are most grateful to Doctor Lobsang Sangay for his authoratitive recent confirmation that the two terms are indeed distinct, with ‘freedom’ covering a range of interpretations that are less emphatic or singular than ‘independence’. Now firstly you should be aware that these words were comments not attributed in quotation to Lobsang Sangay, so could be open to interpretation and uncertainty as to whether they are an interpretation of the reporter, or a remark made by Doctor Sangay but not formally quoted. However that literary confusion apart the main controversy here is reference to ‘independence’ a word which is taboo to the exiled Tibetan Administration and one which anyone familiar with the Tibetan cause would never associate with Lobsang Sangay or his colleagues who consistently avoid any mention of it. They have no such reservations however with employing the term ‘freedom’, reason being that it is open to a varierty of interpretations, less emphatic and can of course describe a condition of ‘autonomy’, which by coincidence happens to be the objective sought for Tibetans by Lobsang Sangay and the CTA! The degree of appeasement towards the Chinese regime by Doctor Sangay is such that the mere association of Tibet with independence sets in motion various levers of denial, censorship and evasion, while always carefully reassuring China that ‘we are not seeking independence’. So what does the Harvard trained lawyer do on realizing that he has been attributed as affirming Tibet’s cause for independence is not without hope? Why he calls upon the New York Times to immediately issue an amended, restrospectively edited version, expunging any reference to ‘independence’! So there we have it! In a panic to ensure that China’s pathological sensitivities concerning Tibetan independence were appeased Lobsang Sangay has the word ‘independence’ removed and replaced with ‘freedom’ from comments attributed to him by a reporter. Remember dear Tibetans that if he and his fellows in the Central Tibetan Administration regarded the two words as having the same meaning, in terms of politics and international law, then he would have felt no need to insist on the New York Times issuing an emergency revision! 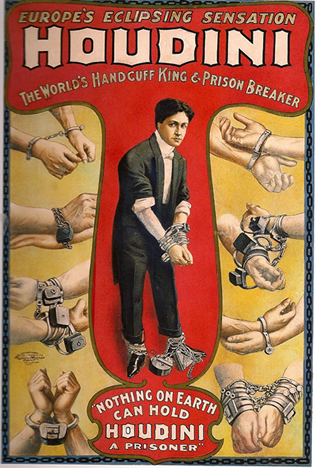 Truth is that he felt compelled to arrange the substitution, because he and the exiled Tibetan Administration know very well that ‘freedom’ is not equivalent to ‘independence’ and were desperate too that China be offered an immediate reassurance that Lobsang Sangay had not been supportive of Tibetan independence. The next occasion Lobsang Sangay appears on Al Jazeera and talks of ‘freedom’ remember carefully this latest episode and know that while he sits and offers what on the surface seem words of support for Tibetans in Tibet he is hiding behind a phrase that is a smokescreen, concealing the reality that he is not committed to the cause that Tibetans are sacrificing so much for, but to securing a condition of autonomy under Chinese rule. That is what the Central Tibetan Administration means when it says ‘freedom for Tibetans’! Can Doctor Lobsang Sangay Escape These Charges? 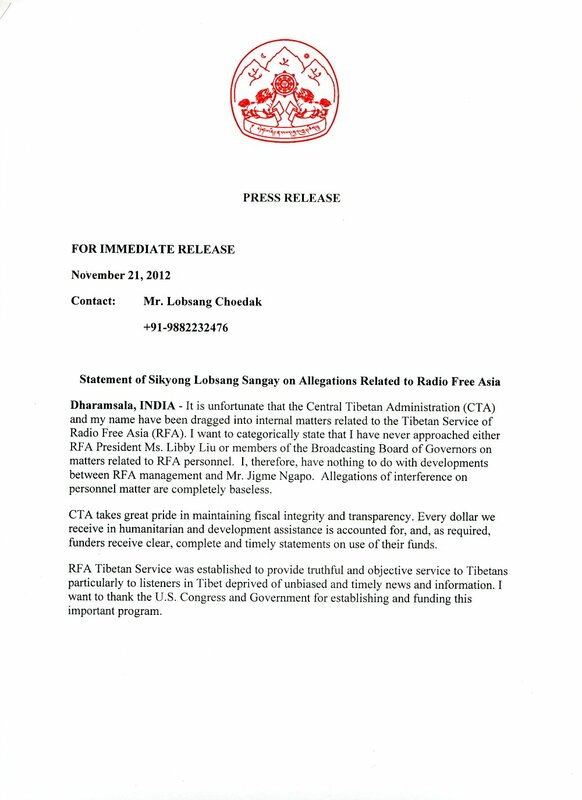 Following extremely serious charges SEE HERE placed before Doctor Lobsang Sangay’s office by Congressman Dana Rohrabacher, a Press Statement See HERE bearing the name of Mr. Lobsang Choedak has today been issued that partially responds to the allegations made by the Congressman. Significantly though this curiously unsigned statement evades entirely the charge that some ‘Tibetan leaders’ have been “cutting a deal with a corrupt and despotic regime”. Why? This is an important statement in that it brings into question the Tibetan reportage of RFA which consistently features China’s propaganda terminology, in describing Tibet, its regions and people. A key question which is being somewhat overlooked in the heat and smoke surrounding this controversy is why for a number of years has RFA presented such a bias and willingly featured China’s disinformation? Just how truthful, objective and unbiased is it of Radio Free Asia to describe a Tibetan, who self-immolates in Labrang in Amdo region of occupied Tibet as ‘ethnic Tibetan self-immolated in a Tibetan area of Qinghai province’? These, and other pressing questions remain unanswered, such as why has Doctor Lobsang Sangay not issued a signed, official statement which addresses all the allegations made by Congressman Dana Rohrabacher? An unsigned press release is less than reassuring and hardly an appropriate or detailed response. Given the importance of this matter Tibetans have the right to expect a full and transparent public response from Doctor Sangay, anything else is simply political escapology.